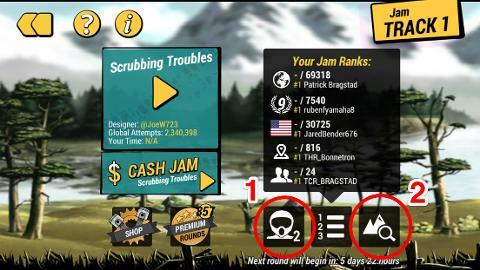 Premium Jam rounds let you access additional features in Jam mode. 1. Race against up to 9 other players at one time. Hit the icon with the helmet (#1 in the screenshot below) to change how many riders you race against. 2. Use the track preview feature. Hit the track preview button to see the layout of the track before playing it (#2 in screenshot below). 3. Watch any replay on the leaderboard. Hit the camera icon on the leaderboard to watch that player's replay (#3 in the screenshot below). 4. Play against any player from the leaderboard. 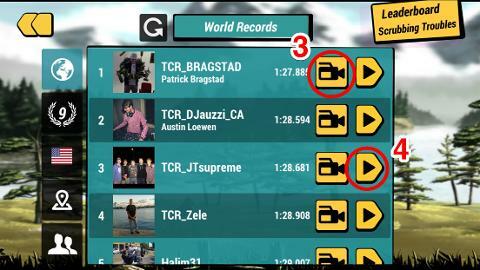 Hit the play button next to any player to race against that player (#4 in the screenshot below).